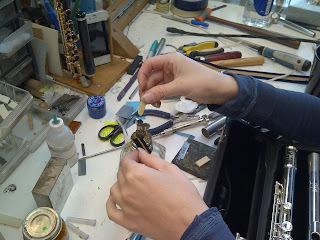 Last week, we discovered that bent keys could be the result of the flute not fitting properly in the case. If the flute is moving around with the case closed, well, damage is likely to occur. Before our repair technician, Rachel, begins her work on an instrument, she does a case fitting to correct any problems with the actual case. 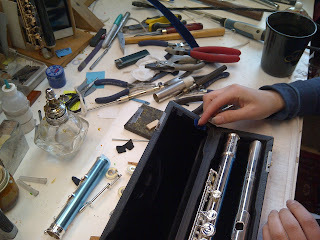 All of that good repair work would go to waste if she were to send the flute back in an ill-fitting case! So Rachel told us that she puts the flute in the case, closes the cover, and gives it a shake. Sounds a bit scary, but the case needs to protect the instrument, so this is critical. You do not want to hear anything moving, but if you do, you know there is a problem. You can remove different parts (i.e. - the footjoint or headjoint) to really hone in on what might be moving if you hear a noise. She tested the case fit on the Signature that she was overhauling and discovered that indeed, there were issues with the fit of the headjoint and footjoint. 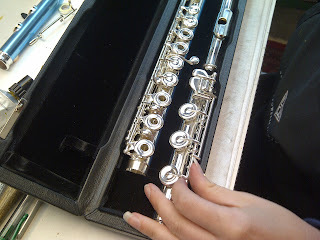 When she opened the cover after the test, she could actually see that the footjoint had moved out of its proper position. So, how does Rachel remedy the situation? 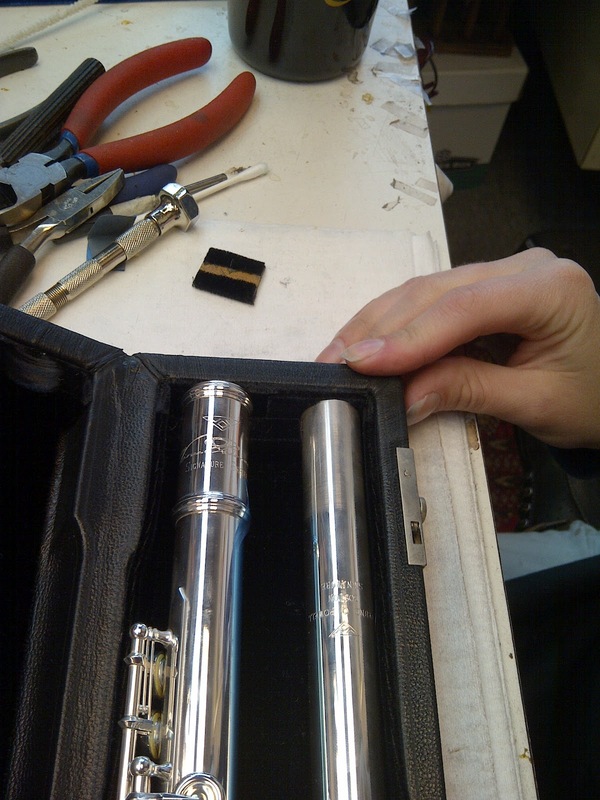 The interior of the case has velvet covered foam to hold the instrument in place. Rachel cuts pieces of velvet and foam to create inserts to improve the fit. 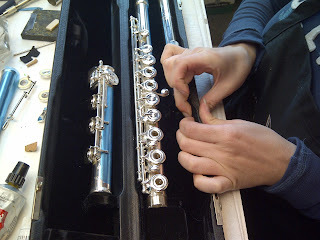 She glues the velvet covered foam inserts into place to get a secure, proper fit for the instrument. 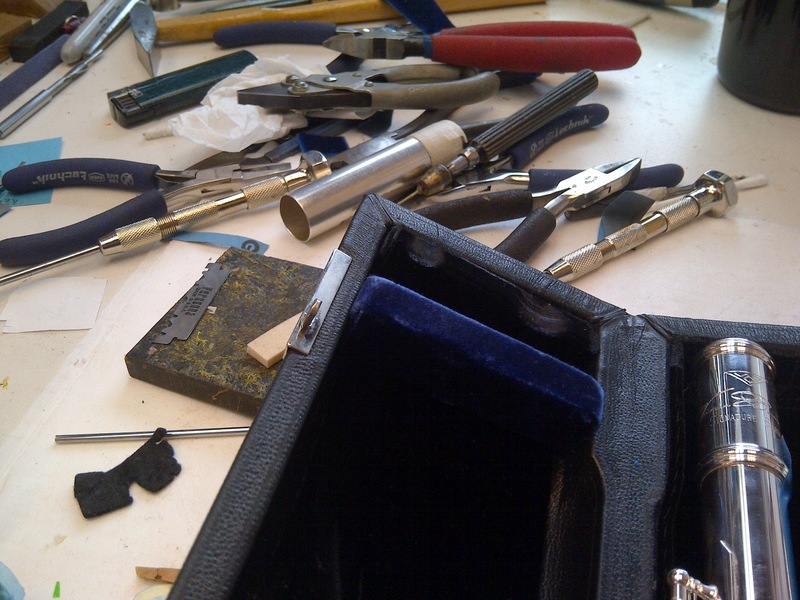 For the instrument in the photos, Rachel created inserts for the headjoint and footjoint areas of the case. The flute case in the photo below has some worn areas on the right side of the cover. If these were really bad, Rachel could cover them with an additional "shim" of velvet, or she may need to replace the entire block. Do not fear -- she would use velvet that matches (we used blue against black just for the photo). Case fit is critical to keeping your flute safe and secure. 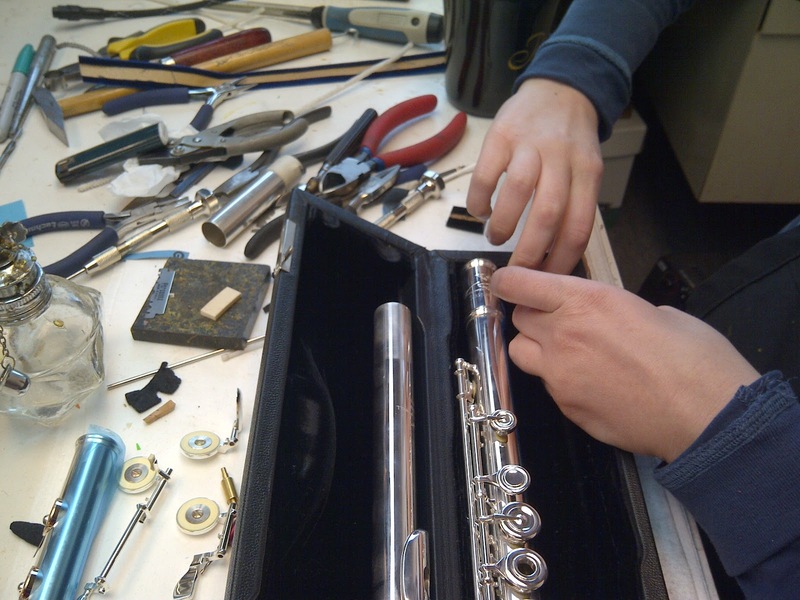 If you think your case may be unstable, never fear -- as we can see from the photos, that can be repaired along with your flute! Gluing velvet to foam for an insert. Placing a new insert into the headjoint area of the case. The insert is now in place. The footjoint really moved during the shake test. Fitting a new insert into footjoint area. Much better fit for the footjoint. Worn areas can be covered with a velvet shim. If this area is really bad, the whole block can be replaced. 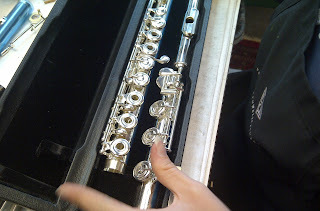 My flute is having the same problem! What can I do? 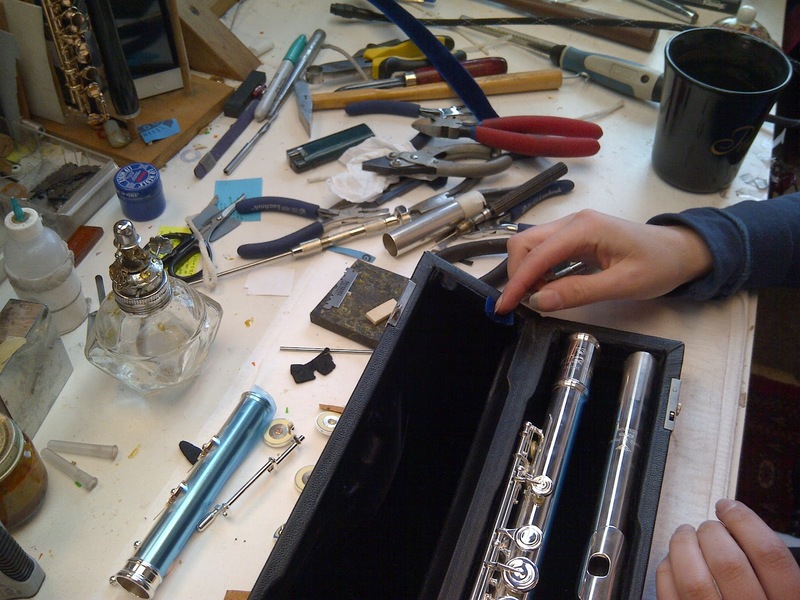 You could take the flute and case to your local repair person to have him/her take a look. They might be able to fix it. Our repair technician here at Powell, Rachel Baker, does this repair all the time.